Sir David Attenborough has had a special relationship with Madagascar for decades. As a young man, he went there to film Zoo Quest, a series created and aired during the early days of television. He has made several return trips over the ensuing years. One of Madagascar's marvels is its extraordinary diversity. On the east side, rainforests - which once cloaked the entire area - still exist (although people have cut-down wide areas of the forest). In the west and south, there is so little rain the landscape is like a desert. Living there - where it may not rain all year - requires very special skills. The central highlands, meanwhile, are suitable for growing crops (such as rice). In this clip, from "Madagascar - Island of Marvels," Attenborough takes us on a journey to an island which was once a part of Africa. He explains how that part of the continent was split-off, to exist on its own, and introduces us to some of its extraordinary wildlife. A great slab of land broke apart to form continents. Madagascar - an orphan chip of land, resulting from that split - was cast adrift. The world’s oldest island, Madagascar is itself split in two by a mountain range with different geophysical characteristics on both sides. Animals living on Madagascar are like castaways on a distant island. More than eighty percent of Madagascar’s species are found nowhere else in the whole world. Long periods of isolation, together with varied landscapes on the island, produce a widely different range of animals. There are 80 different lemurs, for example, on Madagascar. Lemurs range in size from the very small to the height of a child. Primates, they are highly social. By the time they are two years old, some species of lemurs are young adolescents. Family groups stay together for several years. Nearly everywhere on the island, Madagascar has glimpses of elsewhere ... yet there are features only found here. One of the animals - the Tenrec - is similar to a hedgehog. A female Tenrec can deliver as many as 32 babies at one time! That’s more babies than any other animal on Earth. 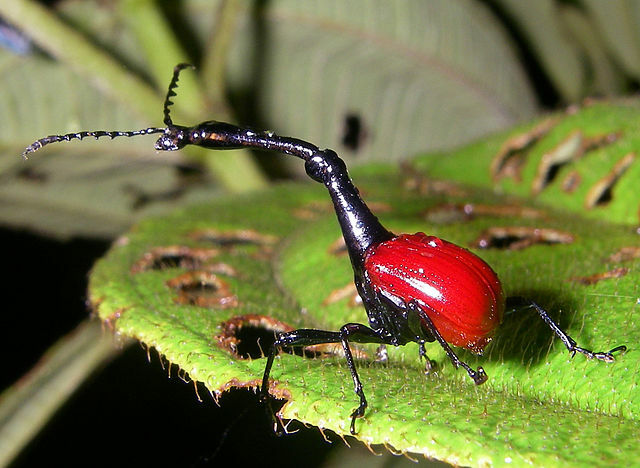 One of the strangest creatures on Madagascar is a giraffe-necked weevil. There’s a reason for those long necks ... males use them for fighting. The females’ necks are not as long as their male counterparts, but they have powerful legs. Using their legs to fold a leaf in half, females curl-up the end of a leaf. Mothers place a single egg into that curled-up leaf end. Each leaf nest seems to have its own design. As she builds her nest, the female giraffe-necked weevil exerts a great deal of effort for a single egg. Among other things, she creates a kind of velcro strip which holds the nest together. When everything is finished, she snips-off the leaf nest and lets it fall to the forest floor. If it survives, the egg will hatch there. Madagascar has had a turbulent past. Geological upheavals did not end after the island was ripped from Africa and India. In the northern part of the island, slumbering volcanoes still dot the landscape. On the forested slopes of those volcanoes lives another Madagascar speciality: a chameleon. Actually ... about half the world’s species of chameleons live on Madagascar! Scientists believe that chameleons were not among the castaways, following the splitting of the island from Africa and India. Instead, they most likely originated on the island itself. 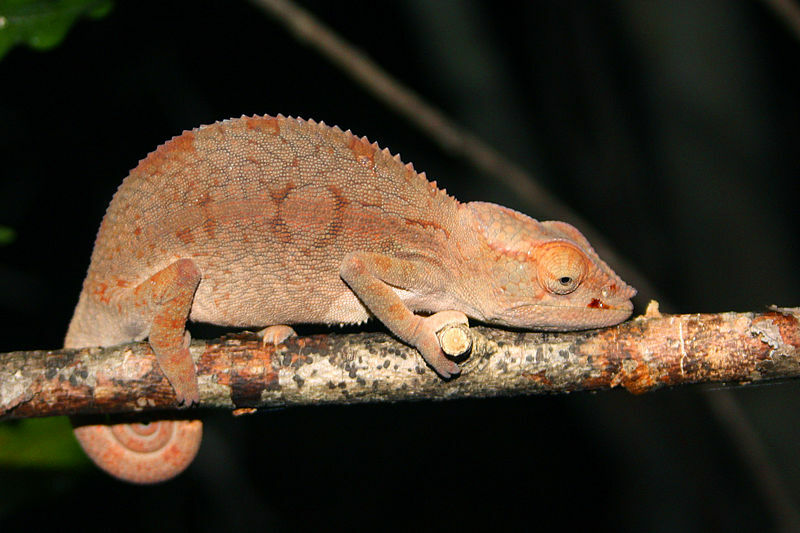 Madagascar chameleons have fused toes which help them to live in the trees. When they move around on a tree branch, their toes - acting like tongs - can tightly grip the branches. Something else is unusual about Madagascar chameleons. Their legs are beneath their body ... a strange fact for this type of reptile. The position of their legs, however, allows them to walk along branches which are thinner than their bodies. Panther chameleons are among the biggest of Madagascar’s chameleon species. When an intruding male ascends into a tree already claimed by another panther chameleon, there will be trouble if the visitor doesn’t leave. After a fight in the tree, the loser - the intruder - drops to the ground. It’s the quickest way out! Clip from the BBC's program, "Madagascar - Island of Marvels," copyright BBC, all rights reserved. Online via BBC Channel at YouTube. Clip provided here as fair use for educational purposes. Bos, Carole "Madagascar - Meet the Wildlife" AwesomeStories.com. Apr 07, 2014. Apr 24, 2019.